Decided against moving today as we are in a nice spot. Following breakfast we walked into Braunston a couple of miles away. After lunch at The Boathouse P.H. our route back took us passed Midland Swindlers also known as the chandlers. We popped in for a look around, you can imagine my surprise that having spent twenty minutes inside we left without spending any money. That's a first. Later back at the boat we picked some blackberries for jam making. As it was our first attempt we only used a pound of fruit. 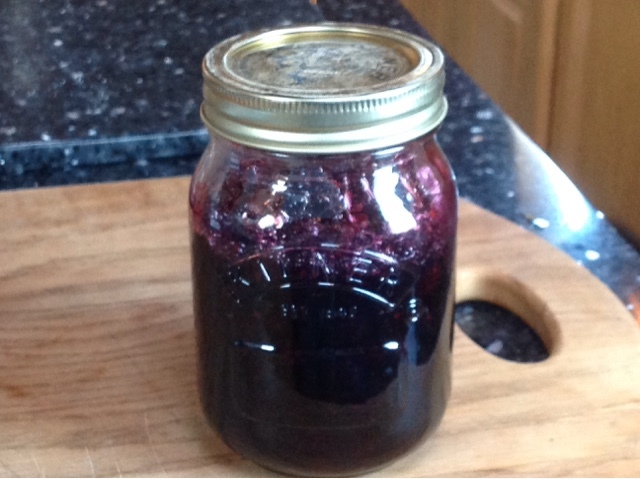 An hour later after sealing said jam in a Kilner jar it hardly seemed worth the effort. We now have the grand total of three quarters of a jar of jam. 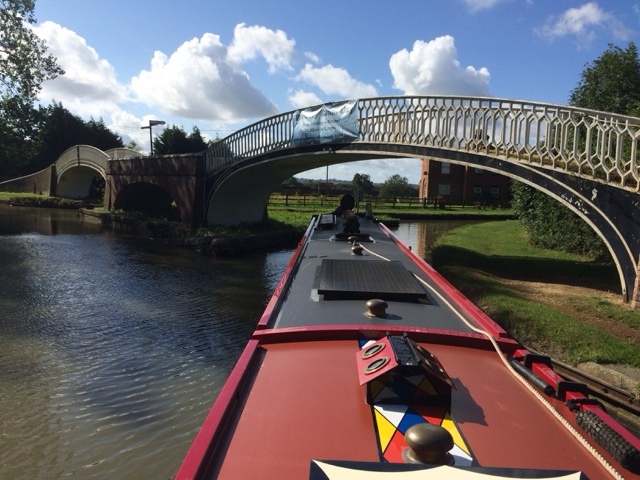 Tomorrow we will be aiming for Norton Junction after a brief stop in Braunston to collect some fenders we have ordered at Tradlines. Well yesterday as planned we had a Sunday roast at 'The Folly', Napton on the Hill. We were not disappointed, large portions of excellent food, and a great setting by the inglenook fire. This morning we got up twice. The first occasion was at the ungodly hour of 0315, to witness the celestial extravaganza that had been much reported. 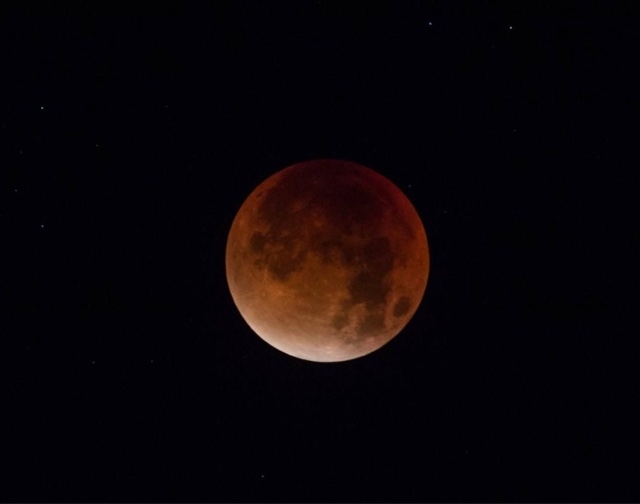 Not so much a blood red, more a rusty brown super moon, but with crystal clear skies we had a good view, with the remainder of the sky filled with stars. Then back to bed, to await our second alarm at a more agreeable 0800 hrs. It was a glorious morning, with the sun shining through the mist hanging over the water. We prepared the boat for departure and just as we were untying, a hire boat passed by to be ahead. The six locks would now be against us. Fortunately, one of the hire crew was on the ball, and as they exited each lock he turned it in our favour before jogging off to rejoin his boat. Our descent was therefore fairly easy. At the bottom lock we filled with water, before setting off again for a leisurely, estimated 3 hour cruise through the Warwickshire countryside. On arrival at Flecknoe we found our spot free, half way between bridges 101 and 100. This is a quiet rural spot so we will stay put till Wednesday when will aim for either Braunston, or maybe even Norton Junction. We really are only a hop skip and a jump away, from our winter waters on the Leicester Line of the Grand Union Canal. The crew returned from their weekend away, and on Tuesday 22/09 we set off for Banbury. We would not have done so, if the Met Office had correctly predicted the weather. 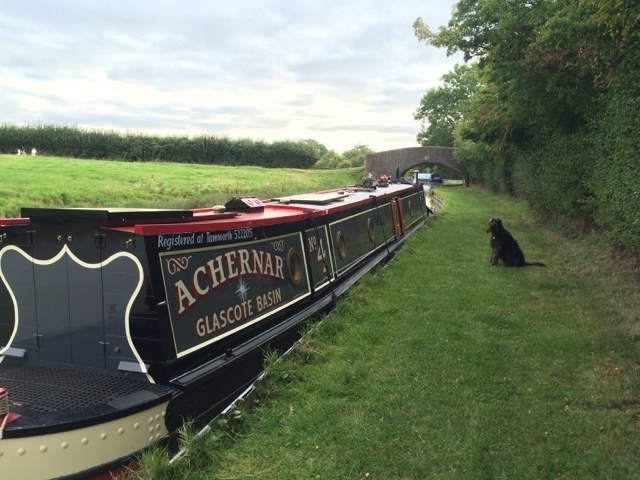 We dropped down a couple of locks towards Cropredy and popped into the marina for services and diesel. This Marina is owned by the same company as Crick Marina, where the annual boat show is held. Whilst waiting we discussed berthing arrangements for the Cropredy Festival. They are currently taking bookings for 2017 as it is a very popular event. No sooner had we departed the marina the rain started. The forecast had been for a 20% chance of a shower. What we got was a downpour virtually all day. On the outskirts of Banbury we winded at Grimsbury Wharf, then moored up adjacent to the large retail park. A short walk later and we were in the Tesco superstore. We had moored the boat using pins, but in the short time we were away these had loosened due the ground being sodden. We opted for a quick, late lunch then set off again with the intention of reaching the village of Williamscot. By the time we had secured the boat it was nearly 7pm. A very late finish for us. The following day Wednesday 23/09 was much better. It was warm and dry, so we travelled with most of the doors and windows open to air the boat. Our destination was Wormleighton, a spot we stopped at on the way. We ascended the locks through Cropredy, and then the flight at Claydon. We were now back on the summit section of the Oxford Canal. Passing through Fenny Compton there were a few mooring spaces and we did not encounter much boat traffic. The canals are starting quieten down now the main season is over. Arriving at Wormleighton we found our spot. Looking over the fields we could see the windmill on the top of the hill at Napton, three miles away as the crow flies. Five hours by boat though. 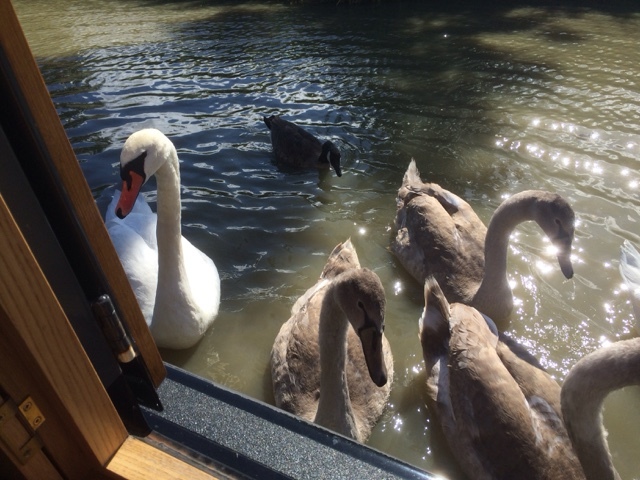 We then saw a strange sight, a family of swans swimming in a line with the adult birds front and rear and the cygnets between. One of the cygnets looked smaller than the others and as they got closer it was clear why. It was a goose that appears to have been adopted. Having had an arduous day on Tuesday we decided a day of rest was in order, and as this was a nice spot we stayed put on Thursday 24/09. Whilst here we were again logged by CRT, they seem quite regular on this stretch of canal. Friday 25/09 was another fine day, setting off just after 8am. Our destination was a pound in the Napton flight by bridge 116. It was another quite day meeting only two boats during the journey. 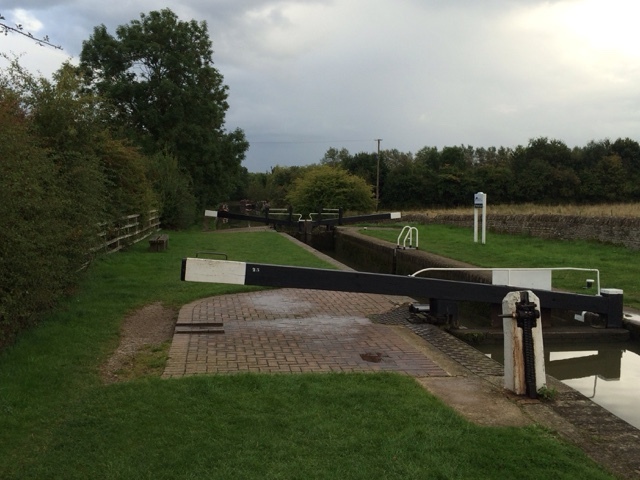 We stopped for water at Marston Doles, then descended three locks to our chosen location. It was warm, sunny, and with good views across the countryside it was the perfect spot. 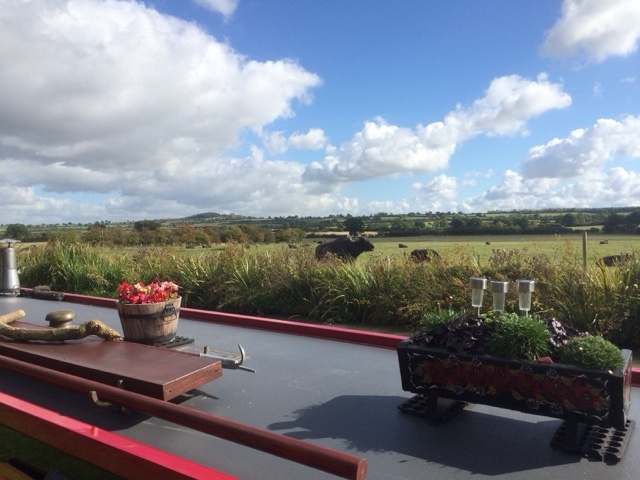 We also had what appeared to be water buffalo as neighbours. After securing the boat we walked down the flight to 'The Folly'. This was to book our Sunday roast but as it was lunchtime we took advantage of their hospitality. 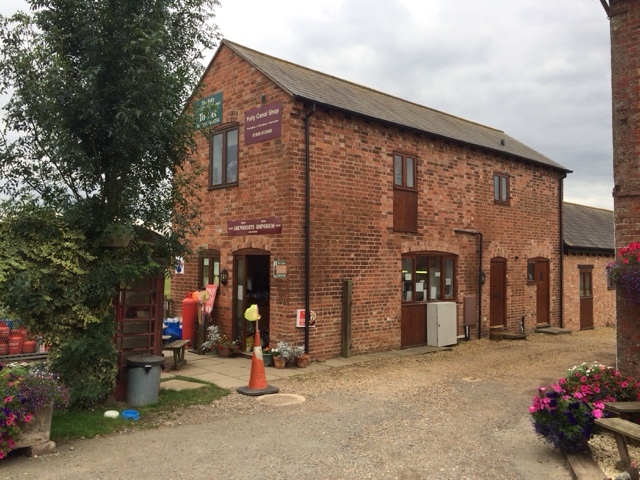 Today we had a walk into the village for supplies at the little shop, then it was back to the boat to wait for the England/Wales rugby to begin. We will stay here till Monday when we will set off for Flecknoe. Yesterday morning with the prospect of a fair weather window we set off from Fenny Compton. First stop the water point which was being used, so we had a short wait before we could fill the tank. 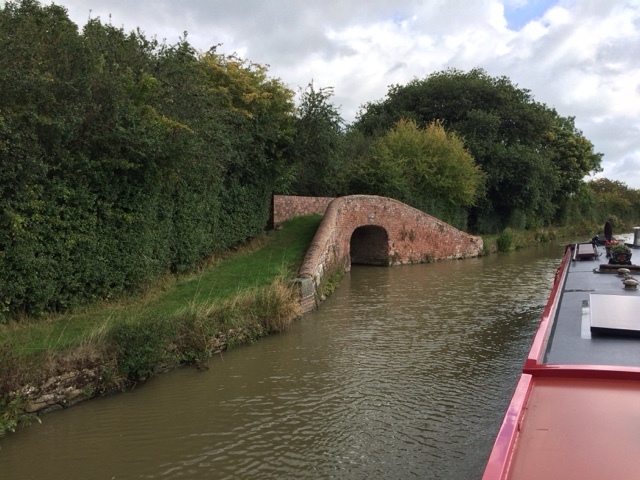 After passing Fenny Compton Wharf we entered a straight narrow section of canal cutting. Originally a 1000 yard tunnel when the canal was first built, the roof was removed some time later. Continuing generally South we passed Wormleighton reservoir, one of three that provide water to the summit section of the canal. Shortly we passed a bridge with a very small opening. I thought this would be a bit tight. It was not however for boats, it was a feeder channel from the nearby reservoirs. We had now left Warwickshire behind and had entered Oxfordshire. Soon we were approaching the Claydon flight of five locks. As we descended, an ominously dark looking cloud was getting closer. We exited the bottom lock and the cloud burst. The rain did not last long but it did not need too. In seconds we had been drenched. The moorings at the bottom of Claydon Locks appeared dank so we pressed on. 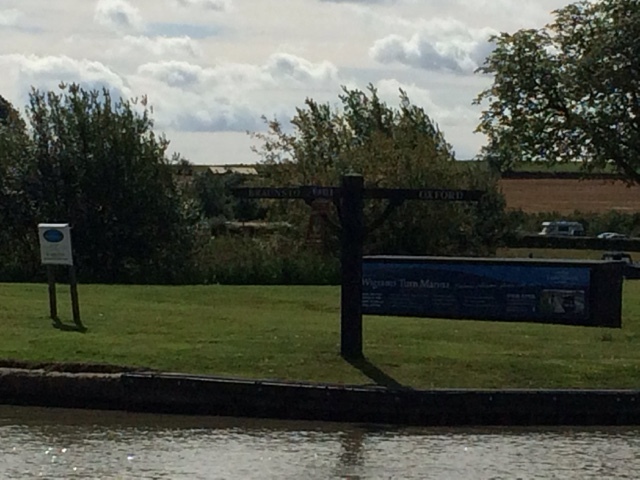 We navigated through Elkington's Lock then found a nice mooring above Varney's Lock. We are about 3/4 of mile outside the village of Cropredy. Later walking into the village we were pleased we stopped when we did. 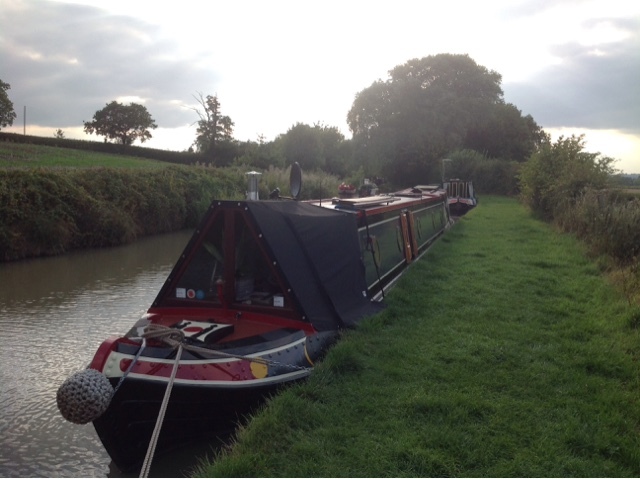 The moorings in Cropredy are only 24 Hr and we want to stay here till Monday so this would not have been long enough. The village has two pubs, we have already located The Red Lion, and a well stocked general store. Today we took our walk early in anticipation of the forecast heavy rain, a remnant of a tropical storm that is due. 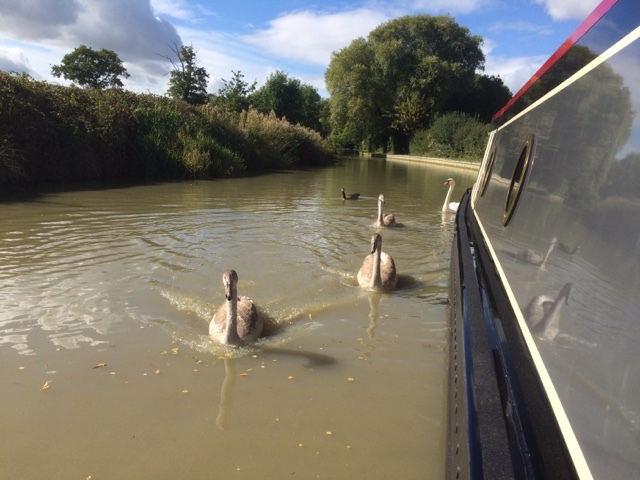 We departed our mooring at about 10, for the short two mile cruise to the village of Fenny Compton. No sooner had we untied the ropes it began to rain. Fortunately it was only a short shower, although the skies did look threatening for the remainder of our trip. We saw very little boat traffic on the way, probably due to the fact the busy cruising season is now over. There is a general autumnal feel to the air, and the leaves on the trees are beginning to yellow. On arrival at Fenny Compton we knew it would be busy with moored boats, but we did find a spot on a slight bend. As we only plan to stay one night this will do. The crew nipped off to the co-op in the village, and I fired up the heating for a while. The hurricane is running perfectly, now the air lock has been removed. As it was lunchtime, we opted to visit the Wharf Inn. The four legged crew was left on the boat because it was raining, and we did not want a wet smelly dog on board. This pub is dog friendly as we have all visited it previously during one of our walks. Tomorrow we will be aiming for the village of Claydon so we will have a few locks to do. Not too much to report today. We were facing the wrong direction for Cropredy following our trip to the services, so it meant setting off in search of the next winding hole of 60 feet or more. This morning we finally got the warm sunny weather the Met Office has been forecasting, so a pleasant day's cruise along the summit of the Oxford Canal was on the cards. The nearest winding hole was at Marston Doles some five miles away. Unfortunately, it was for boats upto fifty foot. We therefore had to descend two locks of the Napton flight, and wind in the Old Engine House Arm. 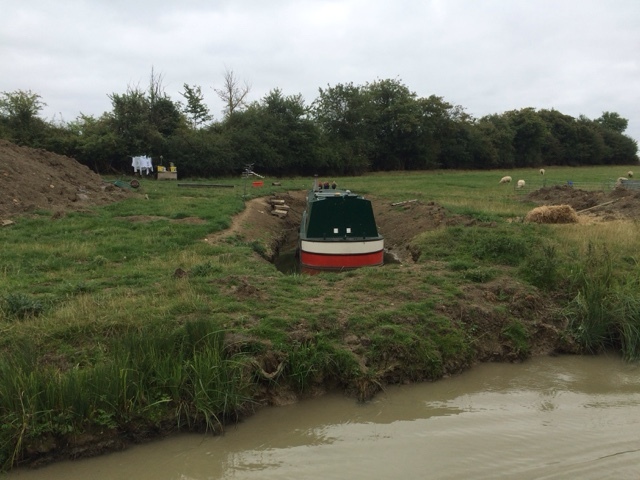 This short arm of canal is now used as private moorings. Having winded, it was then back through the two locks and up onto the summit level. It appeared as if the sun was shining on us metaphorically speaking as well. Having ascended Marston Doles Lock, we saw a queue of five or six boats had arrived and were waiting to go down. As we cruised over the next half a mile, another five boats passed us heading towards the lock. I imagine a two to three hour wait was likely for the last boat. We also got logged twice by the Canal and River Trust. Once just above the locks, and again by a different data checker below. The sun has obviously brought all of them out of hiding as well. We arrived back at the spot we had departed five hours previously, and moored up. We are now facing the right way again. After lunch a few maintenance chores were completed. The heating system had an air lock, so this was bled to remove that problem. The batteries needed a top up with water and an equalisation charge, and the stern greaser needed filling. We will have a rest day tomorrow, then probably stay put over the weekend due to bad weather forecast. 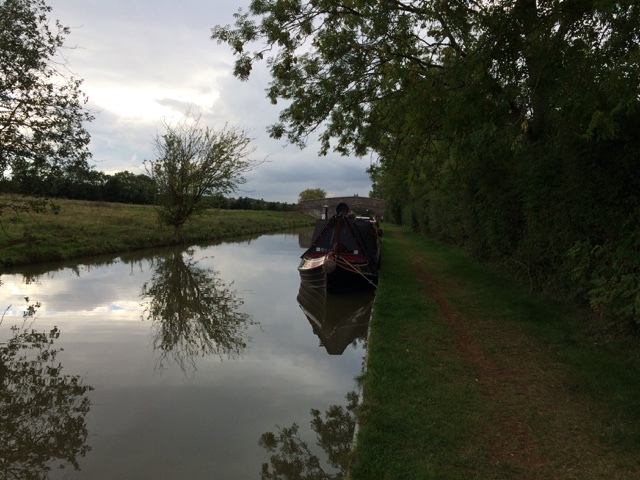 We will aim to be in Cropredy by Thursday as the crew is abandoning ship again to visit family. Our cruise today was simply to get services at the nearest wharf, which happened to be in the village of Fenny Compton. This was about six miles away by the wiggliest section of canal we have yet travelled. As the crow flies it's a distance of about three miles. However we did not want to get to far ahead of ourselves, so this morning we set off with the intention of winding (turning) and heading back towards Priors Harwick once we had used the services. On the outskirts of Fenny Compton we stopped for water at a particularly busy bottleneck, which consisted of a water point, winding hole, public house, bridge, coal boat and visitor moorings, all within 50 yards of canal. Needless to say we observed some interesting boating manoeuvres whilst we waited. Then it was on to Fenny Compton wharf. We winded in the marina entrance which was quite tight, cheating a bit with generous use of the bow thruster. After our pump out we were off again on a return journey. 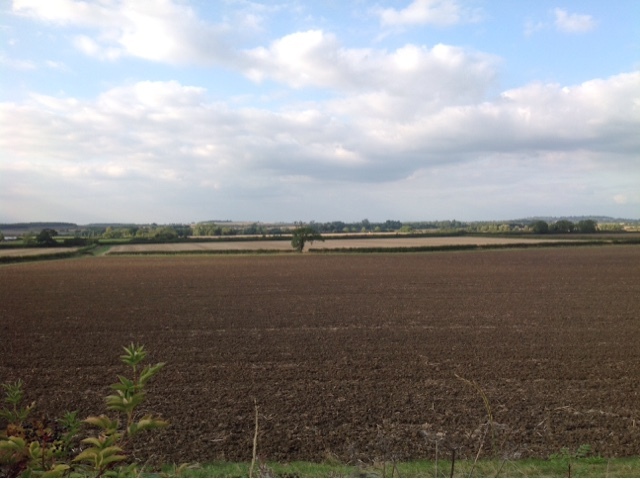 We had seen a spot near the village of Wormleighton on the way, and this was where we were aiming for. We arrived just after lunchtime and secured the boat. 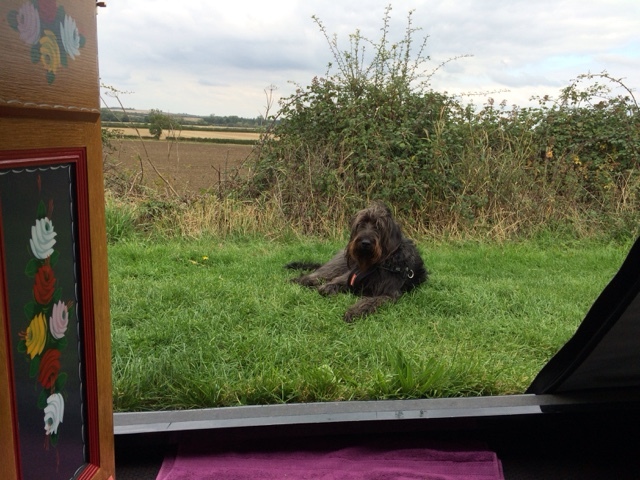 As can be seen in the photo the towpath is wide and grassy and the four legged crew member decided to sit outside for a while. When we arrived at this spot we had it to ourselves. But we have found on our travels that as soon as one boat moors it seems to attract others so we were not alone for long. The view from our side hatch across the Warwickshire countryside. This summit section of the Oxford Canal is very rural, quite and unspoiled, currently. The dreaded HS2 high speed railway is due to carve up this tranquil haven sometime in the future. We will only stay one night here then continue our journey. 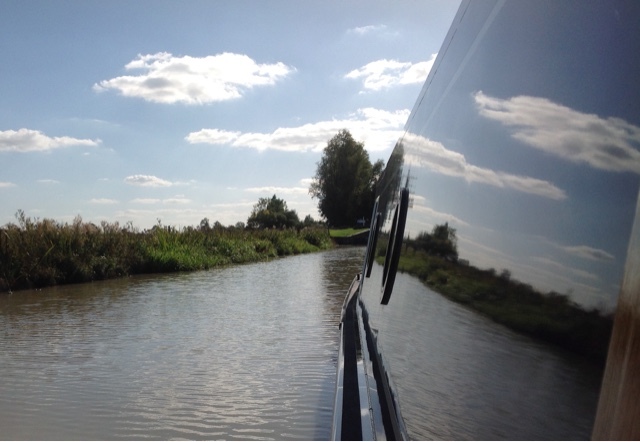 The nearest winding hole is back at the Napton locks so we have to go all the way there first, before heading back this way to continue on towards Cropredy and possibly Banbury. 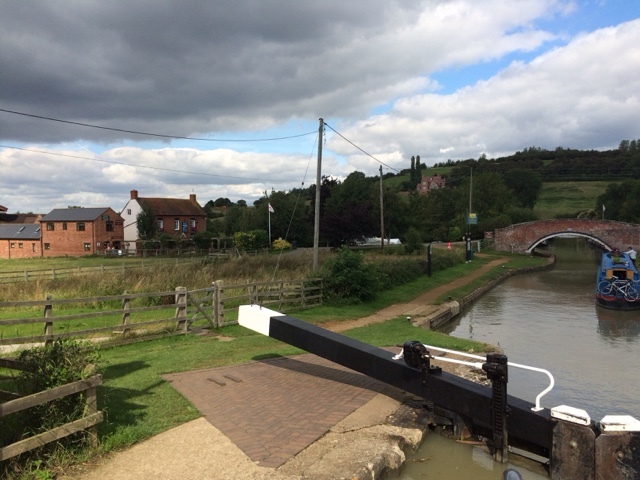 Today we departed Napton on the Hill after our long weekend there. During this time we had become regulars at The Folly. On Sunday, we had our usual roast dinner in front of the large open fire. It was very cosy. 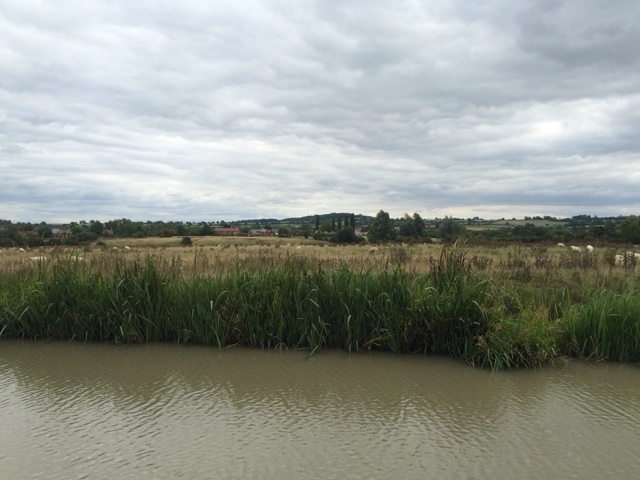 We set off up the remaining four locks of the Napton flight, soon reaching the summit section of the Oxford Canal. 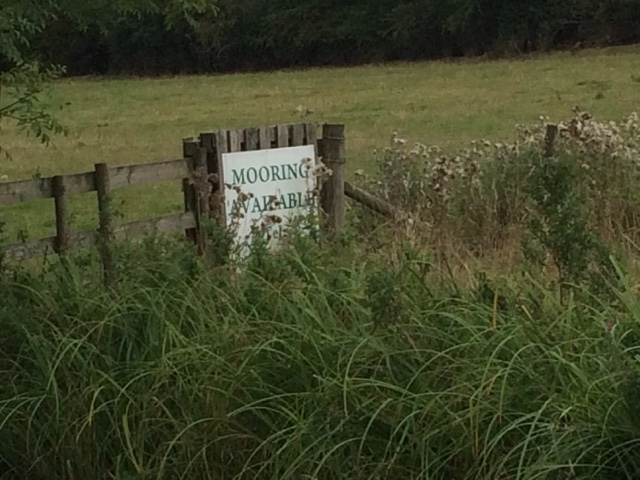 About a mile beyond the top lock, we passed a sign for moorings available. A little further on we saw what was entailed. It seems if you want to moor here, first you need a JCB to dig a channel into the field. 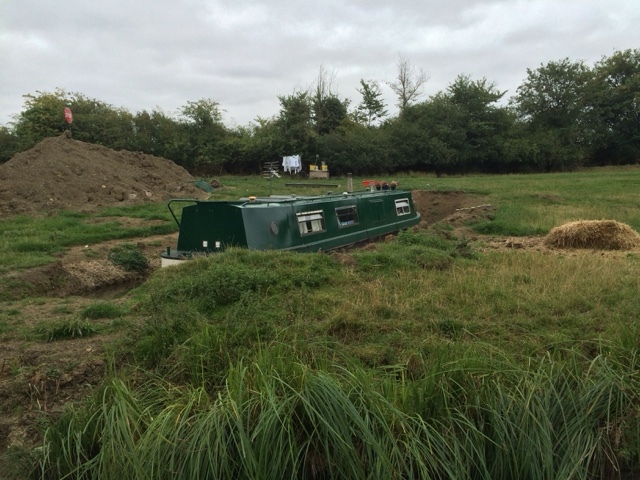 Then, navigate boat into said mooring, before rebuilding the canal bank behind you. The lengths some people will take to avoid the Canal and River Trust license fee. A little further on, we reached our destination for the day, near to the village of Priors Hardwick in the vicinity of bridge 124. After securing the boat we nearly put the heating on for the first time. The Met Office had told porkies indicating that this week was going to be warm and sunny. Well it was bloomin cold where we were. Views of our mooring spot summit of Oxford Canal. We will probably only stay here tonight before moving onto Fenny Compton tomorrow. Hopefully we will also see the sun. Since our last post a week has passed, and it feels as if we have been quite busy. 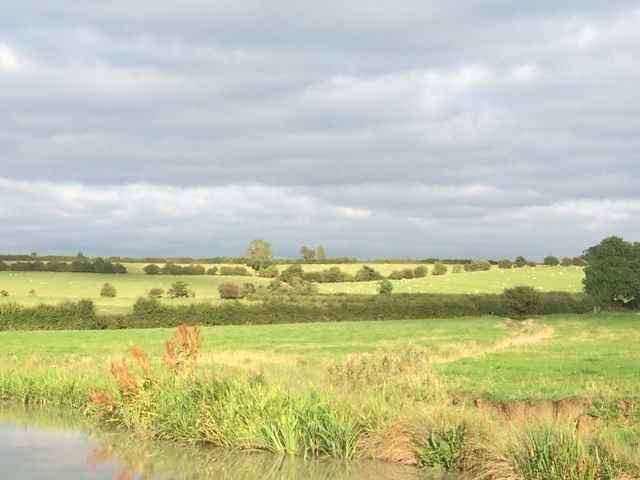 On Friday 28/8 we set off for the canal junction in Braunston. We turned right beneath the ironwork bridges remaining on the Oxford Canal. 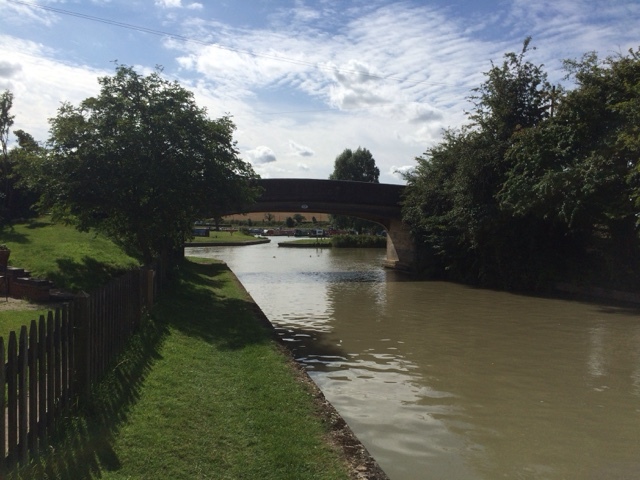 The stretch of the canal between Braunston Junction and Wigrams Turn is shared by the Grand Union Canal and the Oxford Canal. This stretch of water is new to our boat, but we have passed this way before. A few years ago, we hired a Willow Wren boat for a week during the winter, before making the decision to live onboard full time. 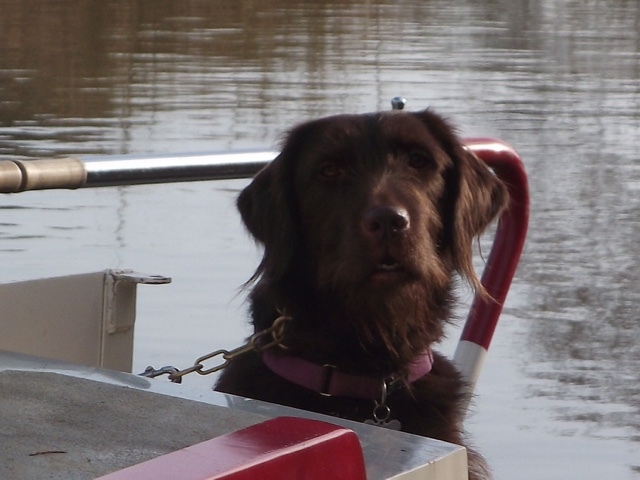 On this trip we were accompanied by our chestnut coloured labradoodle Dylan, who is sadly no longer with us. Dylan keeping an eye on things. We carried on to Wigrams Turn where the Grand Union Canal separates from the Oxford and heads off towards Birmingham. 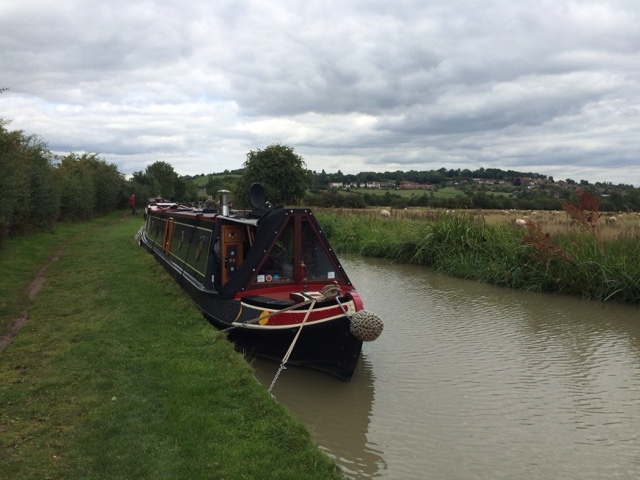 We popped into the marina for services before rejoining the canal heading towards Napton on the Hill. At the second winding hole just prior to the start of the locks, we winded and retraced our route back to Bridge 110, before mooring up. We were then within striking distance of Calcutt Boats for our Tuesday appointment. On Sunday we had a roast dinner at the Bridge Inn. This was closed when we came here in the hire boat so it was good to see that it has reopened and it will definitely get a return visit as the roast was excellent. Monday 31/8 another year passes. I was 52. My present, although I am yet to receive it is a hand operated brass klaxon. 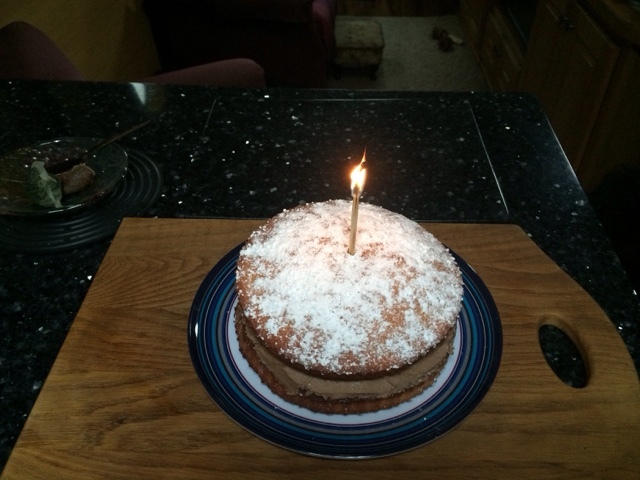 I was also treated to a homemade chocolate birthday cake. We did not have any candles so a long stove lighting match had to suffice. Tuesday 1/9 we set off the short distance to Calcutt Boats. This required turning onto the Grand Union Canal at Wigrams Turn. We had agreed to moor just above the locks whilst they conducted their inspection of our diesel heater. We want it repositioned in the engine room to make servicing easier. The engineer had a look and then it was into the office for the quote. Despite it only being a bit of plumbing work the job was estimated at up to 3 days and the fee was eye watering. The biggest problem however was that the boat would need to go into the workshop, and therefore we could not remain onboard whilst the work is carried out. This means the job will not happen this year. The heater requires a service every 1000 hours of use. In a year we have used it for 115 hours, so I may just leave it for the eight years until its first service is due!!! Departing Calcutt we returned to Wigrams Turn and set off back towards Braunston. Oxford to the right, London to the left. We moored in a nice rural spot near the village of Flecknoe with good views across the countryside. On Wednesday we stayed put, going for a circular walk during the day around Flecknoe. We were logged by the CRT in the morning, not sure where we were last logged but possibly not since Fradley. On Thursday 3/9 our day involved shopping. 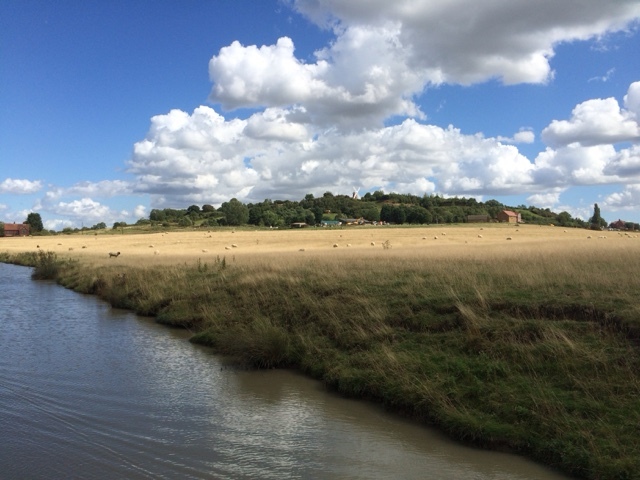 We took the boat into Braunston about a mile and a half, and winded by the marina. The smells coming from the cafe boat, the 'gongoozerlers rest' were as appetising as ever. We moored up close to the pub and next to another boat named 'Milly M'. This is Maffi's boat, and it was good to finally meet him having read his blog for a couple of years. Once secured, we went in search of some wrap round fenders at Tradlines in the marina. After much measuring to ensure a good fit, these have now been ordered and will be ready on our way back in a couple of weeks. We had lunch in the pub, then popped up into Braunston village for some supplies in the grocery. We also nipped into the butchers. Back at the boat we set off again, intending to return to the area of Flecknoe. Both the two legged, and the four legged crew decided to walk whilst I navigated the boat back to our spot. Having allowed some time for the work at Calcutts to be done, now that it is not being, we find ourselves a couple of weeks ahead of where we need to be. So, we have reviewed our travels, and have decided to go and explore Cropredy on the Oxford Canal, and a few other villages on the way. So today we set off after breakfast, for Napton on the Hill. As we got close to the locks we passed by the windmill sitting on top of the hill. We decided to fill with water at the base of the locks, and whilst doing so we were joined by nb Brindley, another Hudson boat we have not met before. We had a good old chat whilst waiting and even had time to visit 'Arkwright's Stores'. All though we did not need anything we made a few purchases as we like to support these valuables canal side stores. We climbed four of the locks in the flight, before calling it a day. Now in a good spot with great views and close to 'The Folly' for refreshments. We will stay put till Monday and as usual Sunday lunch is already booked. Our mooring spot between locks 11 and 12.